In the lead up to Father’s Day, Dairy Farmers, Pura and Masters milks are encouraging Aussie men to put their health first and set a healthy example for their kids. Starting with a friendly reminder to get their serves of dairy or alternatives each day, like a glass of Dairy Farmers, Pura or Masters milk which naturally provides 8 essential nutrients. The behavioral cue follows recent research by Lion Dairy & Drinks (LDD), the brand owners and manufacturers of Dairy Farmers, Pura and Masters milks, that reveals around half of Aussie men are ‘udderly’ confused about the nutritional benefits of dairy, along with only about a quarter of Aussie men strongly agreeing that they make a conscious effort to maintain a balanced diet[ii]. And with 3 in 5 Aussie dads saying they remembered drinking more milk as a child than they give their children now[iii], Father’s Day is a timely reminder to bring back the goodness of milk and dairy for the important men in our life. To remind people of the natural goodness of milk, LDD this year launched the Milk Loves You Back campaign. 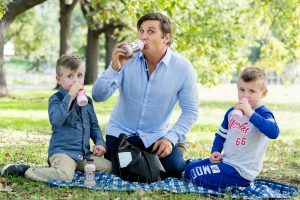 Hawthorn football legend and father of four Shane Crawford has come on board as an ambassador for Milk Loves You Back to help remind Aussie men of the many health benefits of milk and dairy. “I’ve always been conscious to enjoy a healthy and balanced diet, not only for myself, but for my kids as well. Getting milk and dairy into my diet has always been a big part of that,” he said. What’s great about milk and dairy? According to the Australian Health Survey milk, milk-based foods and fortified dairy substitutes are the richest source of calcium in the Australian diet[iv]. themselves about the nutritional value of food and drink (that’s 5 percentage points more than from a health care professional), it’s time to set the facts straight[v]. Are you getting your daily serve of dairy or alternatives? The LDD research reveals just less than a quarter (23%) of Aussie men are unsure about what the contents of a single serve of dairy are. One third (33%) of men thought that two slices of cheese cut it while some thought they needed a litre of milk to reach their daily dairy intake. Whilst the recommended serves of dairy vary by age and gender, the Australian Dietary Guidelines recommend Australians consume around three serves of milk, yoghurt, cheese (mostly reduced fat) or alternatives every day. The Australian Dietary Guidelines state that a serve of dairy is equal to a cup (250ml) of milk, a tub (~200g) of yoghurt and 2 slices (~40g) cheese. Not hitting the mark with your three serves? You’re in good company, with the recent launch of the Milk Loves You Back campaign as you’ll be reminded of the 8 essential nutrients in milk every time you see a bottle of Dairy Farmers, Pura or Masters milk. To kick start some inspiration on getting more goodness into your diet, Shane Crawford is sharing his favourite dairy-based smoothie recipe to try at home for yourself or to treat that special someone this Father’s Day. This recipe is a tasty way to get an extra serve of dairy into your day! The research was commissioned for Lion Dairy & Drinks (LDD) and conducted by Lonergan Research in accordance with the ISO 20252 standard. Lonergan Research surveyed 1,037 Australians aged 18+ and 530 children aged 5-17 years old. Surveys were distributed throughout Australia including both capital city and non-capital city areas. The survey was conducted online amongst members of a permission-based panel, between 30th March and 4th April 2017. After interviewing, data was weighted to the latest population estimates sourced from the Australian Bureau of Statistics. Lion Dairy & Drinks forms part of Lion, a leading beverage and food company with a portfolio that includes many of our region’s favourite brands. Lion employs approx. 6,700 people across Australia and New Zealand predominantly and takes great pride in their local manufacturing footprint, which spans 34 sites – including milk, yoghurt, specialty cheese and juice sites, dairy farms and large breweries, craft breweries and wineries. Lion is a company focused on long-term, sustainable growth. Lion has a clear 10-year strategy to transform the dairy and juice businesses and champion the nutritional credentials of their portfolio; reinvigorate their beer markets and contribute to vibrant and responsible drinking cultures; and build their presence in high-value categories in targeted Asian markets. To achieve this Lion invests in their core strategic assets – their people, brands, production facilities and supply chain.